Have you ever seen “Bottled-in-Bond” on a label of a bourbon and wondered what it meant? Chances are you may already know, but in case you don’t, “Bottled-in-Bond” (BiB) refers to the conditions in which the bourbon was distilled, aged, and ultimately bottled. If you see BiB as a sign of quality, you can thank Col. E.H. Taylor Jr. for his hard work in getting the Bottled in Bond Act of 1897 passed. The history of the BiB Act of 1897 is quite interesting and something you should read more about. I would also suggesting reading great books, such as Bourbon Empire, for more information on the history of bourbon. The short version of the story, is that prior to Prohibition, the whiskey landscape was quite different than we are accustomed to today. Rectifiers would purchase whiskey from distilleries and add, sometimes unsavory and unsafe, additional ingredients to maximize profits while touting their amazing product through marketing information. Many of these additives were harmful to the consumer. Col. Taylor was one of the champions that led the charge to change that practice and bring legitimacy to the bourbon that ended up in your glass. What the Bottled-in-Bond Act did, was add regulations and standards to bourbon so that you could be assured to the quality of the product you were drinking. Well, Zeke and I have decided to take on a monumental challenge (you know because we like Sunday night challenges). Sometimes we even write about them too. There are a lot of BiB whiskeys out there, and it’s something that we know we can’t do in a night. So to be fair to all those whiskeys out there we are going to break these off three at a time. For the foreseeable future, on Sunday nights we will focus on BiBs in groups of 3, and crown a winner each night. At the end of the adventure, we’ll get all the winners together and crown an eventual champion. Now, we may not be able to get our hands on every BiB, but we will promise to try. If there’s one that you are really angry we haven’t tried yet, let us know and we’ll see what we can do. That was a long intro, let’s get into the first challenge. Please also understand that these will be quick and dirty reviews and not the long ones that we reserve for featured bourbons. Since we are reviewing 3 at a time, we’re just trying to hit you with highlights. John’s Take: Vanilla and caramel on the nose. Its a very fresh smell. I’m getting a lot of pepper/spice with this one and there’s a pretty solid Kentucky Hug. There’s a hint of sweetness, but overall the pepper and spice overpower this one. Zeke’s Take: This one is very warm to me with a hint of sweet corn. It’s not an extreme corn flavor, it’s almost like the warmness mutes the corn taste. Our Take: At $15, if you can find it, we’d definitely Buy It. It’s an affordable, solid, bourbon. John’s Take: Spice and oak with a hint of tobacco. The nose again is very fresh, like the Evan Williams, but maybe I’m starting to think it’s more of a manufactured smell. It’s not extremely floral. There may be some sweet undertones here, but I’m getting a lot of oak. It definitely tastes more mature and complex than the Evan Williams. Zeke’s Take: There is a mild spice on the front end almost like chewing honey. I really think this one is a doubled-down bit o’ honey, but if you work it, you get some spice and rye taste. Our Take: You’re going to notice a trend, but at $20, you can’t go wrong if you Buy It. At this point, we asked ourselves, can we eliminate one? The answer was yes. The Old Bardstown was a little more complex and had more flavor in our opinion. The Evan Williams, although good in its own right, was eliminated from the competition. John’s Take: Wow, I’m a little disappointed because I thought going in this one was going to be the champion tonight. The nose is very sweet, but it’s almost like the taste doesn’t match the nose. The oak completely overpowers all the other flavors in this one for me. Zeke’s Take: Charcoal resonates for me. There’s no rye taste, but I still get the rye singe. Our Take: Surprise, surprise, for $10-$15, you can’t go wrong if you Buy It and add it to your collection. Cheers! 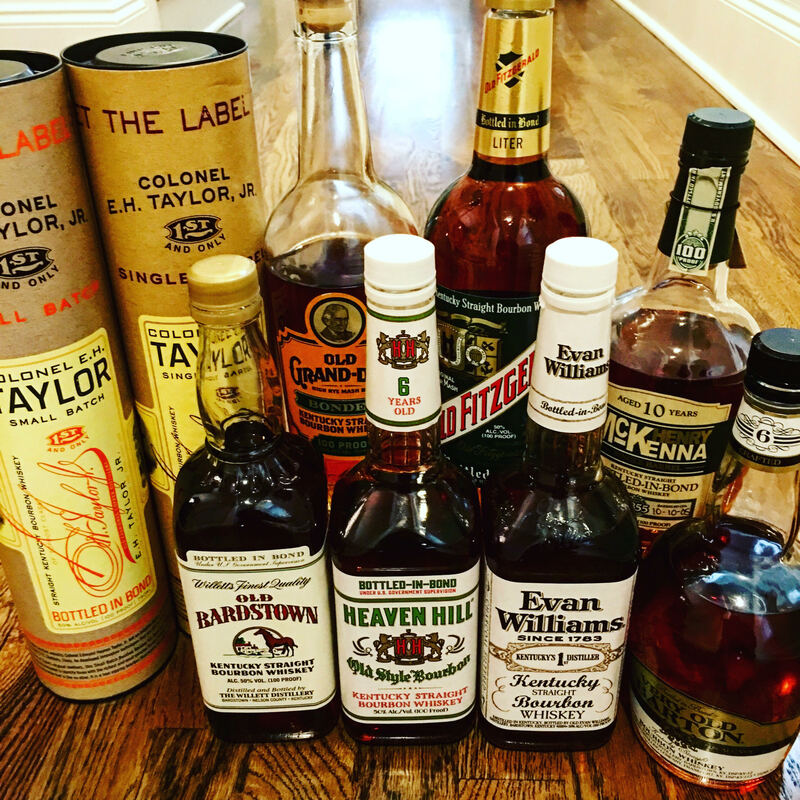 We hope that if this teaches you anything, you’ll find there are affordable, quality bourbons/whiskeys out there that you can try without breaking the bank. Have some tasting nights of your own with your friends and let us know what your rankings are. Love the Evan Williams so am looking forward to picking up some Old Bardstown. Thanks for doing this! Thank you for reading it! We hope you enjoy and please feel free to add in your feedback! Awesome!!! Can’t wait for round 2!!! Neither can we! We have to get ready for Sunday! Looking for an tasty and economical bourbon to warm up those cold winter nights? Evan Williams BiB’s spicy and vibrant profile will satisfy everytime. Agreed! It’s a good one!